Hello All! 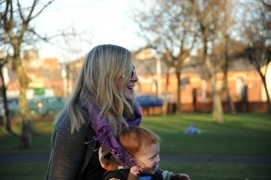 A bit of a catch up from me! I did go to class last week, and Stayed the Same! I was annoyed, especially considering I hadn’t eaten chocolate for a WHOLE week – my lenten sacrifice….but then I thought about it, and realised I had been eating rather a lot of cake, in place of the chocolate, so is it any wonder!! 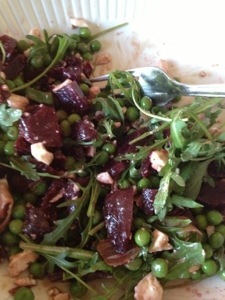 After reading Tonette’s Post recently about Tuna, I went through a phase of having this salad for lunch a few days in a row – cooked beetroot, tuna, feta, rocket, petit pois and balsamic vinegar (reduced in a pan to make it syrupy!) delish and filling, and warm too, as I tossed in the peas right after steaming. I shop in SuperValu, for most of my Groceries, and last week while I was there (starving, having been to class and not eaten for most of the day!!) 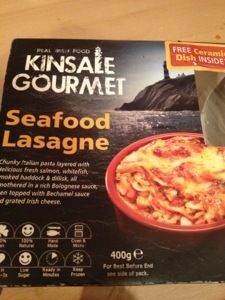 I passed a stand where a gentleman was cooking samples from this new range – Kinsale Gourmet. 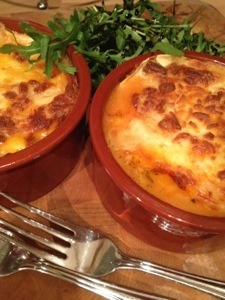 I sampled the Seafood Lasagne, pictured left, it was delish and I picked up 2 on the spot for dinner that evening! The bonus is they came with the lovely earthenware dishes!! The Lasagne itself was very tasty, I let it defrost for a few mins and tipped the pie from the plastic pot into the ceramic dish and baked them in the ceramic in the oven. 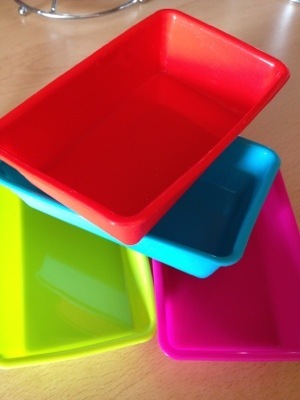 These are really handy, freezer to oven or microwave and all natural ingredients!! Himself was so impressed with it that I went back and got 2 more, and got 2 of the cottage pies to try soon, so now I have 4 lovely dishes! I hope this company do well, it’s nice to support a small Irish Business! There may have been 2 nights out with too much alcohol in between this post and the last, but no chocolate, 2 whole weeks now, I am very impressed with myself and the cravings have almost gone too. I was a bit hormental yesterday and really wanted some but I cut up a melon and had some of that, which didn’t work, so then I had a corn on the cob with a touch of butter and some black pepper and that filled the gap!! – on a small plate that fits in the top tier (or I use baking paper with the sides twisted up to form a saucer shape, place the 2 fish fillets side by side, sprinkle with some garlic powder, chilli flakes and a splash of soy sauce, salt and pepper and put the lid on. – Timer will ping, dish up! I like to mash my sweet potato on the place and himself adds jalepeno relish – the flavours really compliment the spicy steamed salmon. It’s so easy I will make it again and again. 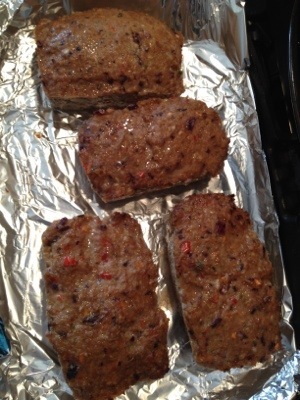 I bought these dinky little mini loaf tins a while back to make brown bread with my son, he loves to bake, and he loves brown bread, but when I came across this recipe on Slimming Eats I knew I had found a great new use for them! I set myself a “Fridge” challenge, to use up what I have before shopping again and my rummaging uncovered a packet of Turkey Mince, an onion, a very sad looking carrot and a red pepper. 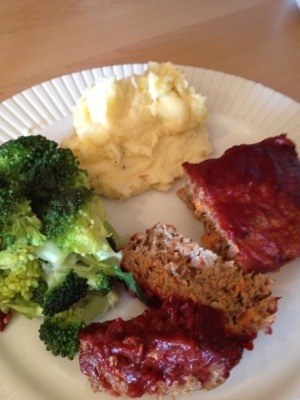 I decided to try the meatloaves using Lean Turkey Mince instead of the Beef in the original recipe, and using the pepper instead of courgette. We picked some parsley and oregano from the garden boxes (the excitement of doing this to a 4 year old whose job it is to water the plants every evening is lovely to see!) Added the Paprika and breadcrumbs and Junior had the important job of cracking in the egg with no shell!! Mixing all together was of course squidgy fun and then into the 4 tins, they measure 3×5 inches each. Baked at 180 for 20 mins, as tins are silicone, no spray needed. After 20 mins, the recipe instructs us to remove the loaves, take out of tins and put in an oven proof dish (I being lazy and not wanting more dishes, lined a tray with tin foil), then brush with the glaze. I followed the glaze recipe as is with the exception of Passatta, I had none, so I used an extra tablespoon of purree and 2 tablespoons of water. (The meatloaves at this point had a LOT of liquid around them, I drained this off before taking the meatloaves out of the tins and onto the tray). The loaves are taken out after 10 mins baking with the glaze on, and more glaze put on, and back into the oven for another 10 minutes. Meanwhile, I decided to serve these with Chedder and Spring Onion Mash (another recipe on the Slimming Eats site). I used reduced fat chedder but otherwise made no changes at all to the recipe, the only difficulty I had was to try to stop “tasting” the delicious mash while waiting for the meatloaves to finish baking!! 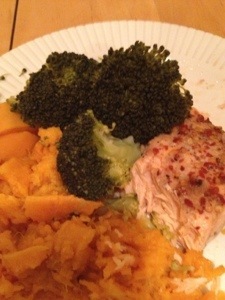 The final meal I served up with mash, and a good serving of Brocolli for Superfree. Really delish and Junior wolfed the meat and brocolli down, mashed potatoes not so much, but can’t argue with him when he devoured all the brocolli! !